Hitachi's revolutionary encryption technology defies the conventional wisdom, and does not require decryption before searching. Documents being searched are secured by AES-256 bit encryption and are able to be searched without decryption. Can perform as well as normal search technology. It takes only about 4 milliseconds to search 1 million words and is still being improved. Solves security and performance issues of encrypted full-text search using a highly reliable technology which is ensured by mathematical proof. 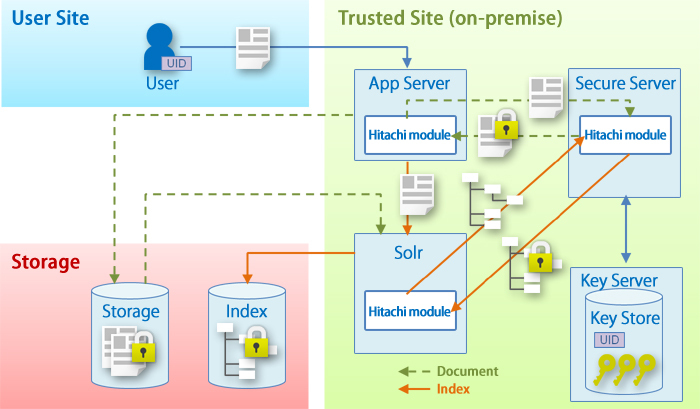 Hitachi applies its patented original encryption technology to a full-text search engine, enabling fast search of encrypted documents using an encrypted index. Users don't need to decrypt any data to perform searches. Credeon Secure Full-text Search assures simultaneous usability and security of stored data, making the use of public storage compatible with corporate data security policies. Using public cloud storage, users can isolate data from internal operations, prevent hacking, and prevent unauthorized access from government agencies. User data will be encrypted using a random number in accordance with probabilistic encryption method. The data in storage and search index are not decrypted for the search function. Credeon Secure Full-text Search uses Industry standard AES-256 bit encryption algorithms to encrypt data for full-text search. This specification which is adopted world-wide guarantees the toughest data protection capability for enterprise search. Original unique algorithm using a homomorphic function and fast symmetric key cryptosystem gives Credeon Secure Full-text Search realistic search performance. It takes only about 4 milliseconds to search every 1 million words, achieving close to unencrypted search speed. Credeon Secure Full-text Search uses a highly reliable encryption scheme developed by Hitachi based on homographic function and symmetric key cryptosystem. The trustworthy data security and practical computing speed of this unique technology is ensured by mathematical proof. Credeon Secure Full-text Search provides plugin modules which run on a fulltext search engine (e.g. Apache Solr). System architecture and Product components are shown in the diagram on the left. Credeon Secure Full-text Search currently provides a NFR Single User Edition. This edition is for testing and evaluation of the searchable encryption technology. Note: Storage feature to store uploaded documents is not included in this product. * The product and company names mentioned in this document may be the trademarks of their respective owners.